The 2017 Big Brother Naija winner, Efe who recently released a new single, titled ‘Based on Logistics’ was seen with Mavins Boss, Don Jazzy. 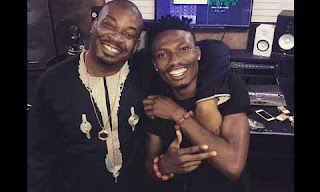 The BB Naija winner was pictured with Mavin Boss, Don jazzy inside his Studio leaving fans speculating if Don Jazzy was planning to sign Efe to Mavin Records. What do you think? Would you love to see the “Based on Logistics” crooner signed to MAVIN?